Aristotle observed that eudaimonia is the highest good for human beings; that which distinguishes humans from animals is our "human essence". That is, we are a rational and social animal, so living a good human life means seeking to know and acting rightly — virtuously — with others. So, how does one become virtuous? Aristotle believed that individuals who achieve eudaimonia would possess twelve (some say eleven) virtue traits, and those virtue traits would fall within a "golden mean" between the vices of excess and deficiency — striving for existence between the extremes is moderation. In the above triad, we can observe what not to do at the extremes of excess and deficiency. By understanding what exists at the extremes can we intuit moderation — the "golden mean". Take for example the following: For troops on the battlefield, it is enough to observe that the most effective leader would not put their soldiers’ lives at risk by recklessly attacking the enemy? Or that the leader worth following into the crucibles of battle would not command the trust of their troops through inaction or cowardice? But then how we can define that indefinable characteristic of courage? Well, we know with much more clarity what courage is not. Therefore, we can intuit what courage is: The lack of cowardice and recklessness. But knowledge of the triad is not enough. With this understanding, leaders must seek to repeatedly apply the principles of moderation in pursuit of their mission or aim. So that by continuous application leaders may intuit moderation in themselves, may learn to manipulate the nature of things around them, and may improve the outcomes for those they serve. Through this habit of action, leaders subliminally direct others into doing what is right. As is the case with those who exhibit any fullness of character: Others will begin to emulate it. This good, for it is the case that the most effective leaders do not preach moderation but rather continually demonstrate it at all times in themselves while acknowledging in others what acting wrongly looks like. And in doing so, leaders help those they serve achieve moderation. The goal of a leader is to create an environment where those they serve can develop eudaimonia. In doing so, individuals not only want to do what is right, but they do it because they derive pleasure and purpose. Such is the nature of a team being the reflection of its leader. The Flight of Icarus by Jacob Peter Gowy. 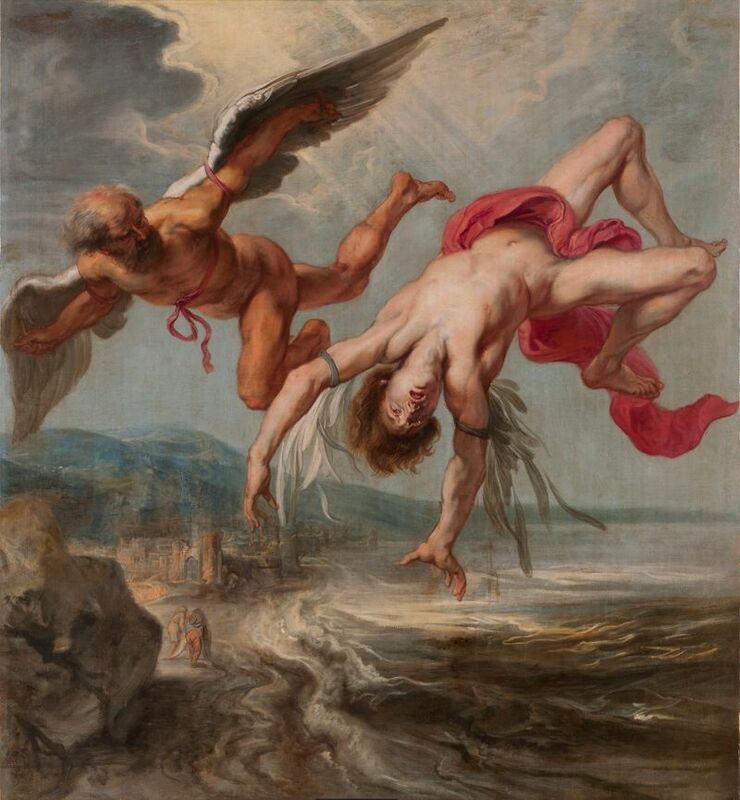 Daedalus warns his son Icarus to "fly the middle course", between the sea spray and the sun's heat. Icarus did not heed his father; he flew up and up until the sun melted the wax off his wings. For not heeding the middle course, he fell into the sea and drowned. Image from Wikipedia.org.